Just like the characters in the movie, they work well together. 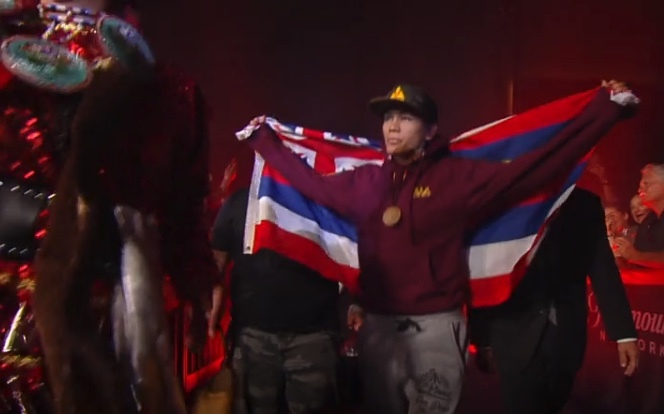 On Saturday, December 15, 2018, inside the packed Neal S. Blaisdell Arena in Honolulu, Hawaii, the latest in a series of Bellator MMA events took place featuring one of the State’s favorite daughters Ilima-Lei MacFarlane who had returned home to defend her Bellator MMA Flyweight Title in the Main Event which aired on DAZN.com beginning at 10 p.m. ET/9 p.m. CT, with the preliminary bouts streaming across the Internet on Bellator.com and globally on the Bellator Mobile App. 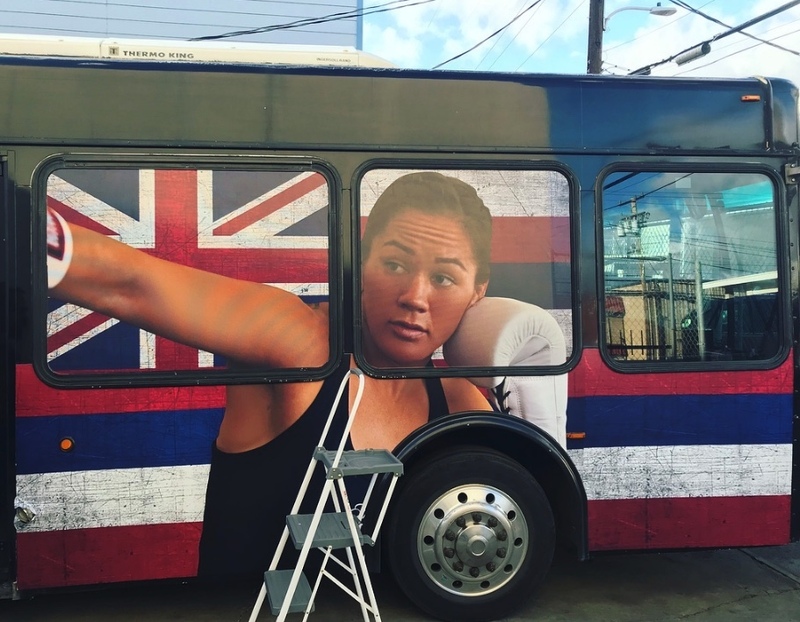 Another example of their clever in-house marketing: before Valentine’s Day, an Ilima-Lei Macfarlane sponsor came up with this idea of a Date with the Champ. Entries came pouring in creating bedlam at the local post office. 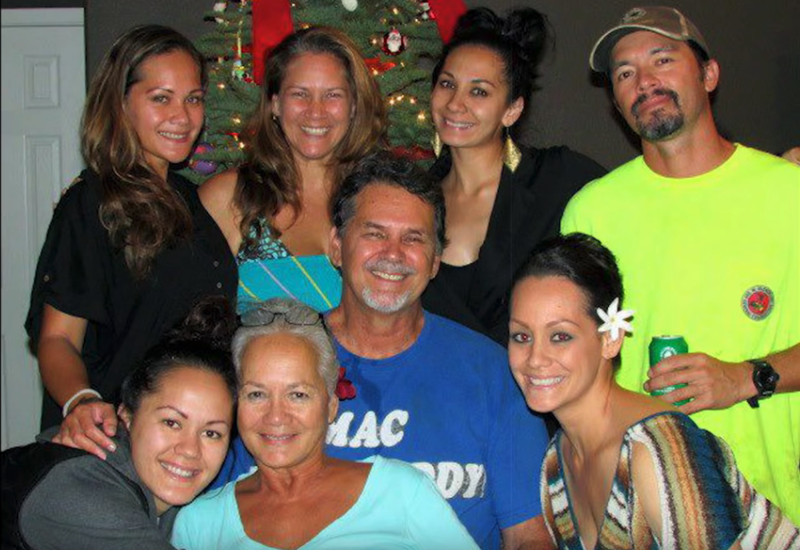 Ilima-Lei Macfarlane, born and raised in Honolulu, Hawaii, came to San Diego, Calif. to complete her schooling at SDSU, San Diego State University where first she attained her Bachelor’s degree and then started work on her Masters. 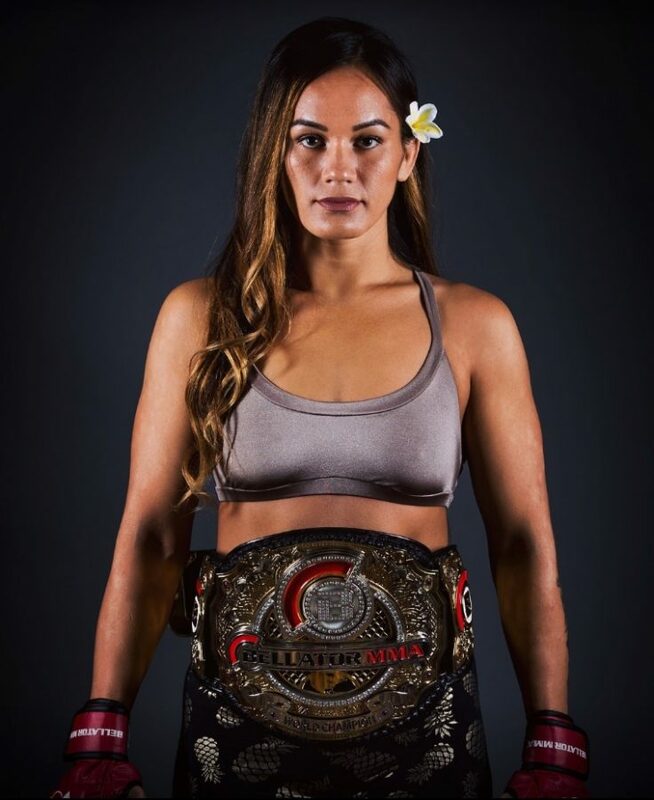 During this period, the former state of Hawaii Wrestling Champ trained at the local San Diego Combat Academy on Mission Gorge Road with her current coach Manolo “El Hurrican” Hernandez. 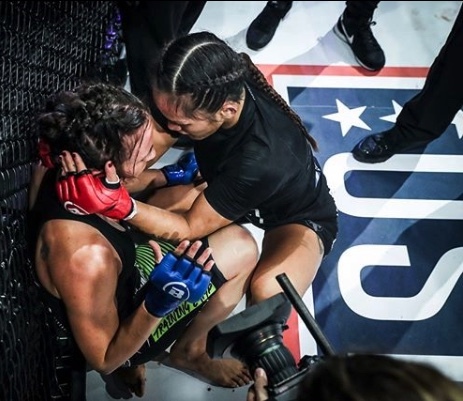 After a major expansion, her gym changed its name to 10th Planet Jiu Jitsu and instead of just working out to stay in shape, MacFarlane then became serious about fighting and in 2014 began her amateur career. This development was certainly a departure from her earlier plans and of course the folks back home were a bit bewildered. 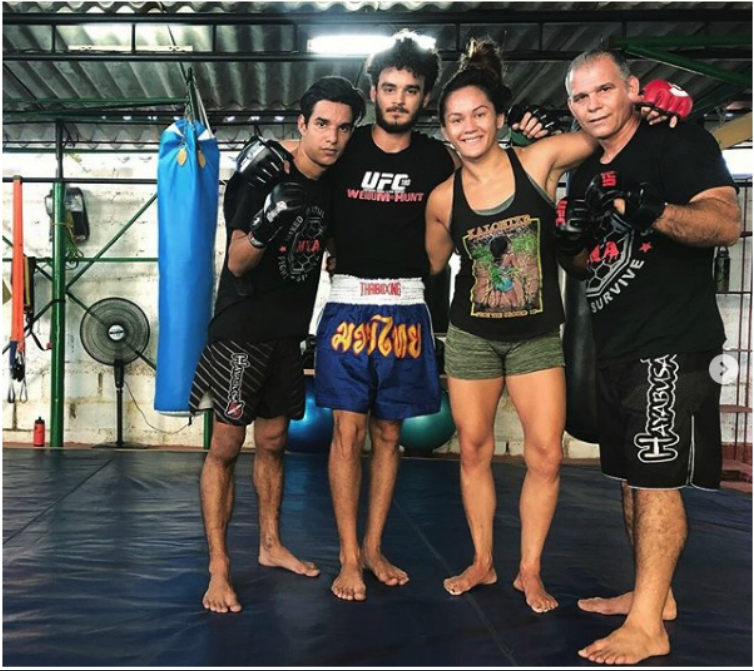 They had been helping with the finances to realize her dream of attaining an education and later that master’s degree in liberal arts and sciences, and now she was serious about making a stab at being a professional cage fighter. 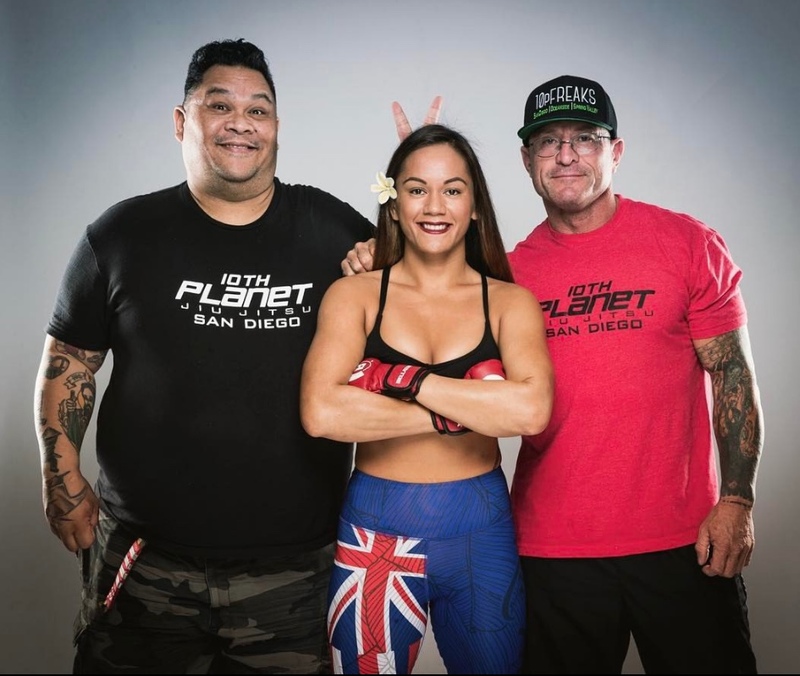 Always the court jester, here we see Coach Manolo “El Huracan” Hernandez with 10th Planet Mission Valley owner Bill Crawford posing for a photo with their current champ Ilima-Lei Macfarlane. Every Rock Star needs a tour bus and here is the one they had arranged for their Mega Star to travel around the Island of Oahu. At their first Press Conference, Ilima-Lei Macfarlane made certain her opponent Valerie Letourneau (r) received the traditional Lei. Is it soon to be showtime or always showtime with these two? With her trusty Arm-Bar coming through once again, the home folk went crazy clapping and cheering for their local hero. It’s referred to as ‘having home field advantage’ and there was no doubt, the majority of fans were there to support their local hero. Even with the lights turned down low, Ilima-Lei MacFarlane’s uproarious fan base could be heard from miles around. After the victory, Macfarlane consoles her beaten opponent. 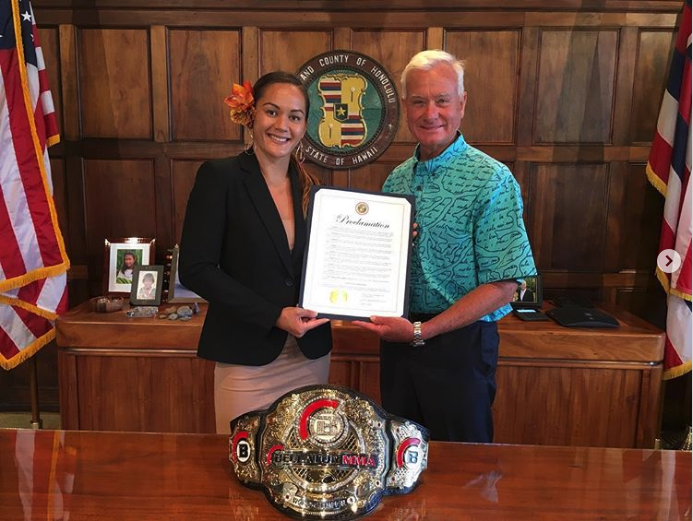 In early September, Mayor Kirk Caldwell proclaimed September 17 as ‘Ilima-Lei Macfarlane” day in the City and County of Honolulu as part of a private presentation in his office. “It’s a real honor to present this special proclamation to Ilima today, calling it her day,” said the Mayor. “For me and I know for the people of Hawaii, we look for role models, and we want to show that we are as good as anyone in the world. She has shown that and even more. Setting an example for the youth of our community and for everybody. Also, before their return home, Valerie Letourneau and Macfarlane were honored at the yearly Hawaii Bowl game which took place on December 22, 2018. 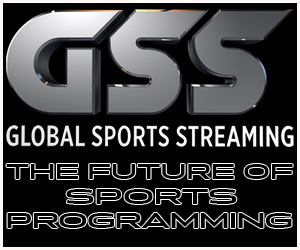 The game featured the University of Hawaii Rainbow Warriors taking on the high scoring Louisiana Tech Bulldogs who blew the game open in the 3rd quarter to win 31-14. 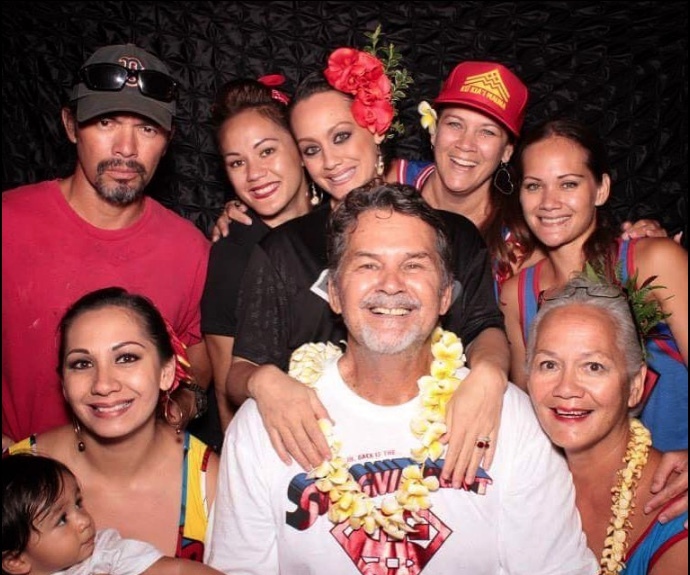 The oh-so proud family which includes Mom, Dad plus siblings join Ilima-Lei Macfarlane for one of those classic family portraits. 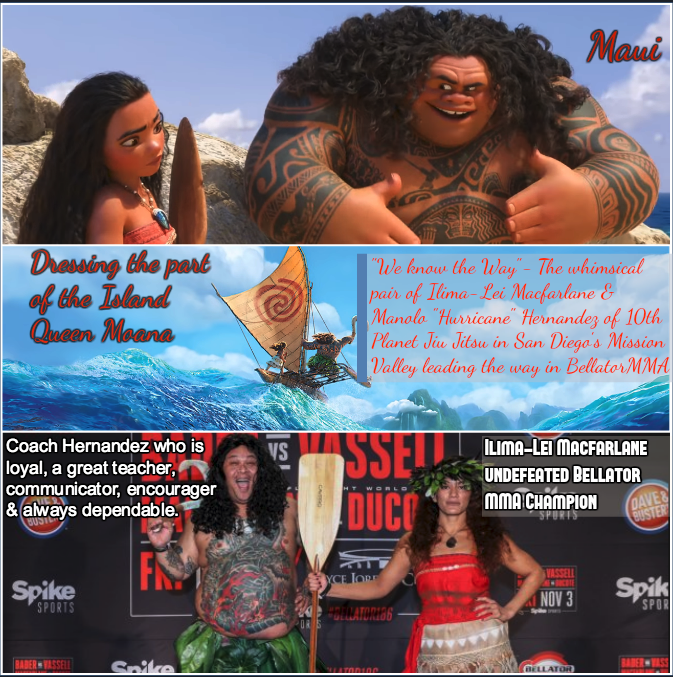 Below are some of the messages Ilima-Lei Macfarlane sent to her fans after her big win. The final one was sent from Havana, Cuba where she was on Holiday and training at a local MMA facility. Happy Aloha Friday from Havana, Cuba. That semi-retro photo shoot that I did in Hawaii a few months ago reminds me of this place. Vibrant colors, classic cars lining the streets, and that laid back island vibe everywhere. The internet is very limited here which forces you to maybe read a book, use a standard map to navigate or actually strike up a conversation—a difficult task with the very limited Spanish I know, but they appreciate the effort, and we end up communicating with lots of hand motions and laughter. I’ve eaten foods at five-star restaurants here but so far my favorite food has been a simple home cooked meal of shredded pork and yucca potato by mi casa particular hostess, Mama Tamara. The locals are very friendly if you want interaction and the guys are not creepy. I feel completely safe at night wandering the dark streets alone as a woman (although maybe it’s my physique that deters attackers as this little boy pointed out to me when he saw my biceps 😂). Much of the colonial style buildings are dilapidated, save for one room which a family of six probably lives in, but there is a beauty in the ruins. Havana so far is hauntingly nostalgic, yet the country is now in an arms race to catch up technologically with the rest of the world. I’m not sure if it makes me happy or saddens me to know that all of this will most likely be gone in the near future. I have a few days left here which are filled with salsa lessons, el Museo de la Revolucion, a cooking class on traditional Cuban food, a tour with an economist, and a drag show. I could never forgive myself if I left Havana without seeing their Cuban Queens. 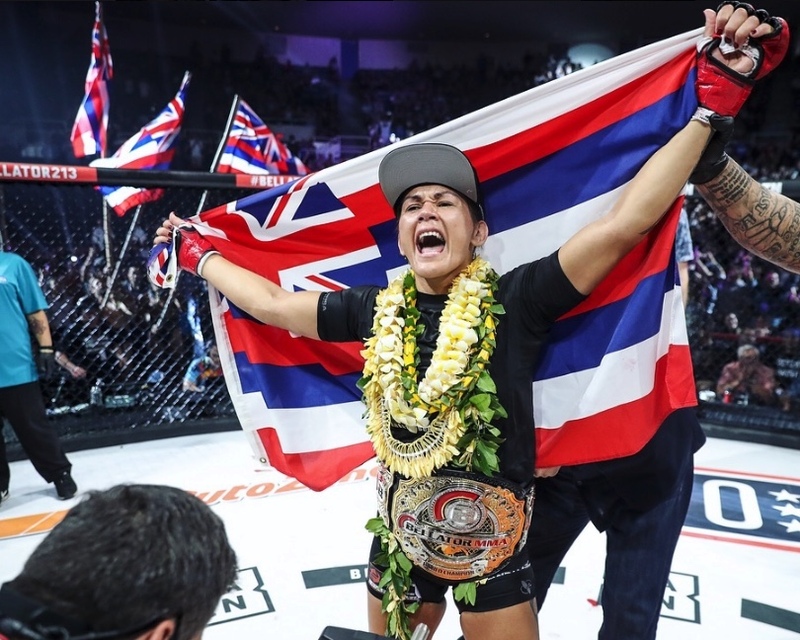 Thoughts in regards to her fight in Hawaii: Congrats from everyone: Hau’oli Makahiki Hou from our Ohana to yours. Fast forward to the present: ilimanator Cuba was by far the most interesting country historically that I’ve ever visited. My favorite parts of the trip weren’t when I was in the fancy hotels or bars or partying amongst other foreigners…it was when I was sitting and talking story with the locals, trying to understand what it’s like to live here. Seeing the discrepancies between the lifestyles of the tourists and the locals didn’t make me feel sorry for Cubans that they seemed to have so little…it made me feel lame that we (Americans) require so much to be comfortable. With the rationed supplies they had, my host families always made sure that they prepared more than enough food for me. Everyone that I met thought it was the coolest thing ever that I was a luchadora and for most, I was the first Hawaiian they had ever met (many people asked if I was Mexican or Brazilian and were stoked when I said “estoy Hawaiiana”). And they all said that I better come back to visit because I have new familia in Havana, Cuba ❤️. I’ve been waiting this entire time to finally say this but … half of my heart is in Havana, ooh nah nah. Muchas gracias to my new Cuban fight familia, Yoel Box MMA gym for taking me in! These guys are very good kickboxers and taught me some really good techniques in the clinch. Then without warning they put me through shark tank. 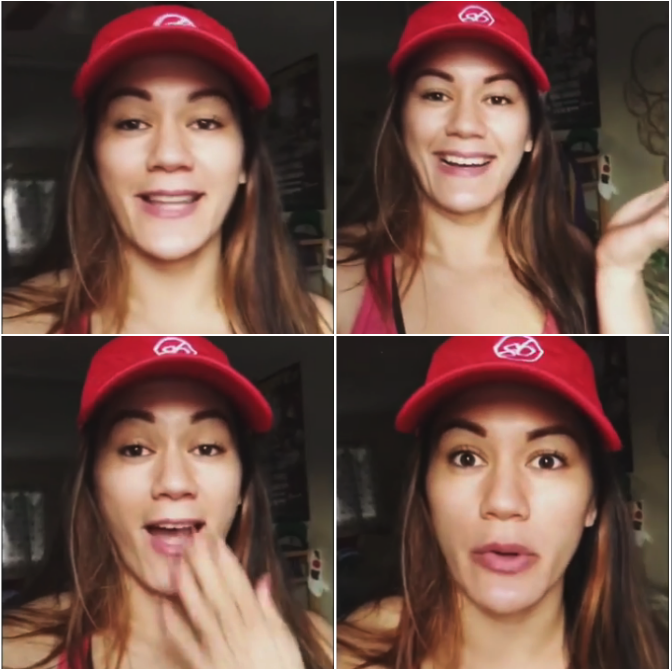 That’s so awesome: Hawaiian heart and soul sharing your Aloha. So proud of you! Bellator returns to the Pechanga Resort & Casino in Temecula, Calif. on Friday, March 29, 2019, with an exciting welterweight clash, as former 170-pound world champion Andrey Koreshkov (21-3) squares off against Southern California native Lorenz Larkin (20-7, 1 NC) in the Main Event. Tickets for the event go on sale Friday, December 14, and will be available at the Pechanga box office, as well as Bellator.com, Ticketmaster.com and Pechanga.com. The event will be broadcast live and free on the Paramount Network at 9 p.m. ET/8 p.m. CT and simulcast on DAZN.com, while preliminary action will stream on Bellator.com and globally on the Bellator Mobile App. 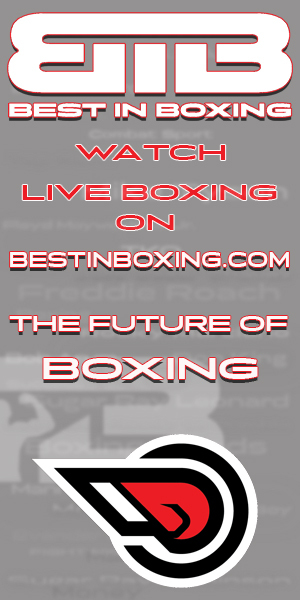 Additional bouts will be announced in the coming weeks. 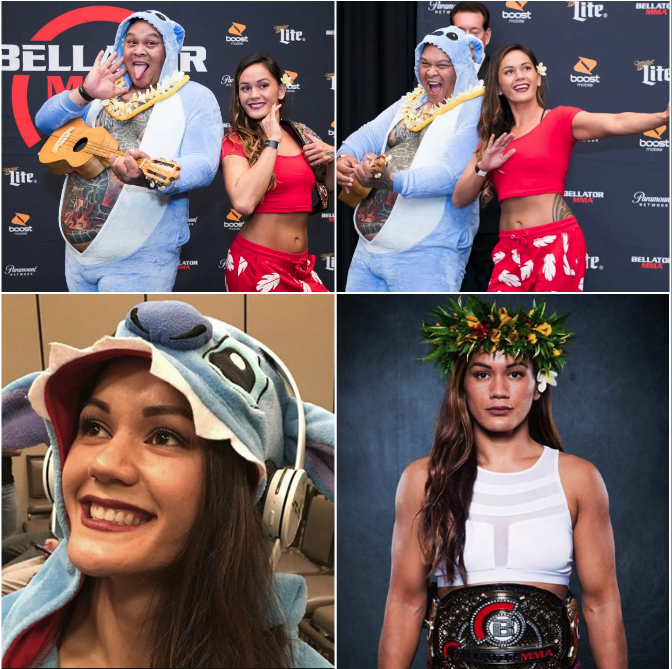 “The Pineapple Princess” has been a reflection of perfection thus far in her MMA career and without a doubt she is a sterling role model for her home state of Hawaii. 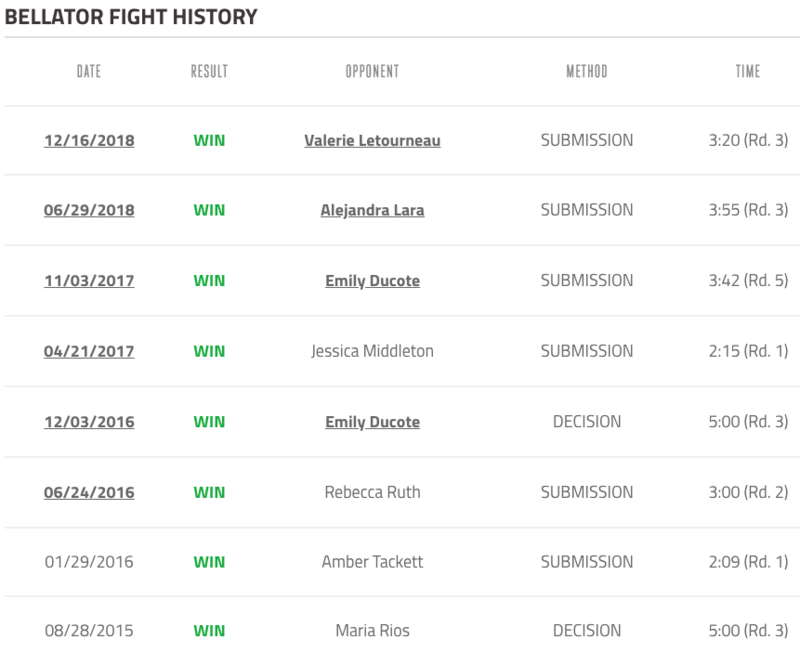 Macfarlane now holds an impressive (undefeated) record of 9-0 (six by submission, two by decision, one knockout) and has established herself as one of the very best flyweights in the world today. 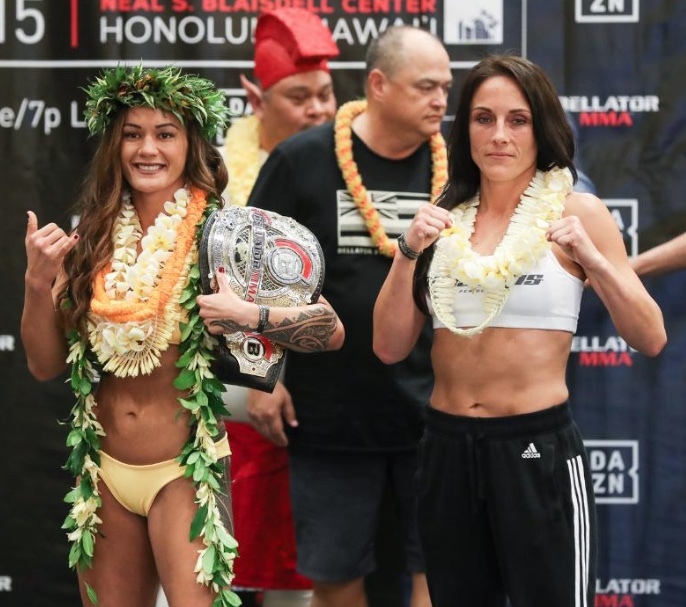 The atmosphere for an event in Hawaii was already going to be big enough to make it the biggest fight of her young career but adding an opponent of such experience as Letourneau made it even more of a challenge, a challenge Macfarlane happily embraced. Round one was a bit of a feeling out process. 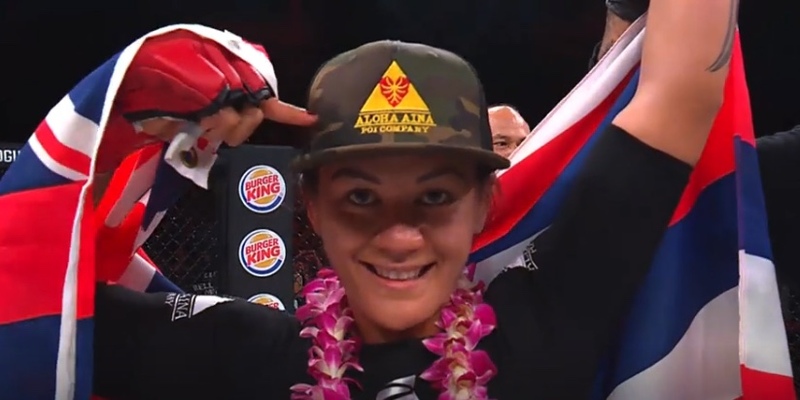 Both women seemed tentative at first, but overall Ilima-Lei Macfarlane was able to get off the more effective strikes. 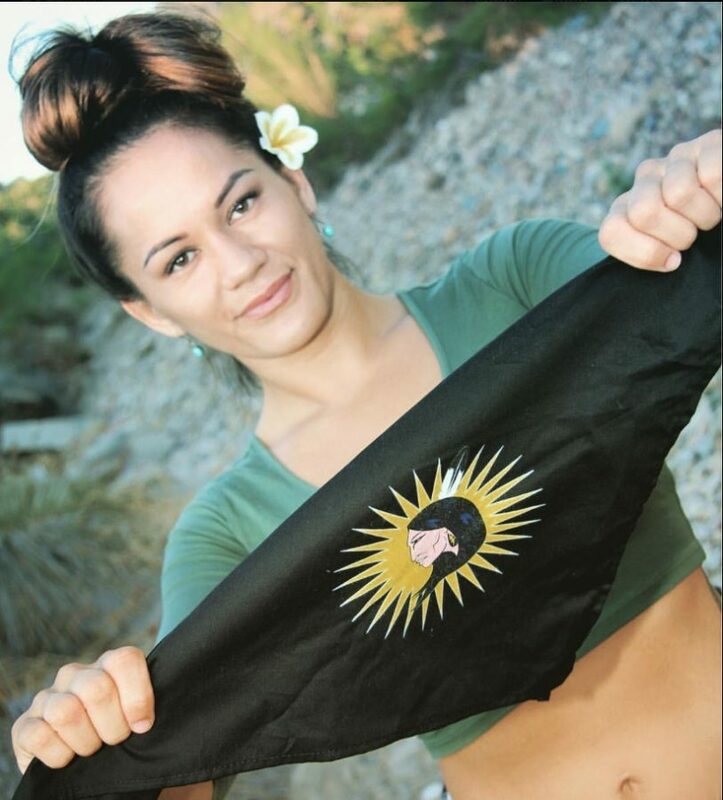 The undefeated Hawaiian champion locked up Letourneau in a triangle choke early in round three. Then, while holding the Canadian in this submission hold, began unleashing some brutal elbows from off her back. Eventually the pressure of the submission hold mixed with the nasty strikes forced Valerie Letourneau to tap out. 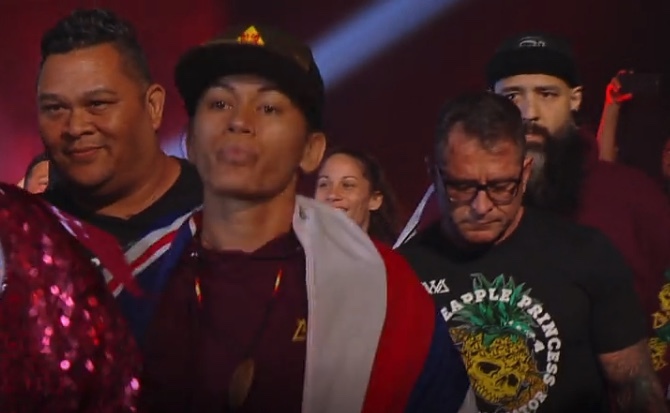 After a closely contested second round, Ilima-Lei was able to take control in round three.